Our Campaigns - Candidate - John Glover Roberts Jr.
Name John Glover Roberts Jr. Nominated by George W. Bush on January 7, 2003, to a seat vacated by James L. Buckley; Confirmed by the Senate on May 8, 2003, and received commission on June 2, 2003. Service terminated on September 29, 2005, due to appointment to another judicial position. Nominated by George W. Bush on September 6, 2005, to a seat vacated by William H. Rehnquist; Confirmed by the Senate on September 29, 2005, and received commission on September 29, 2005. 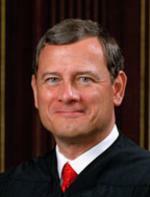 Roberts was initially nominated for D.C. Circuit Court Judge in January 1992. However his nomination was never acted on and returned to the White House upon Bush's term expiring.